Good morning and Happy New Week to all of us, I believe We all had a Great Weekend. This Post is to remind and motivate us to stay positive in every thing we do, in our thoughts, in difficult times and also in merry times. 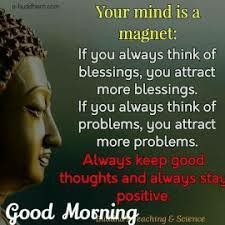 First off what is a MAGNET:- It is a piece of iron or other material which has its component atoms so ordered that the material exhibits properties of magnetism, such as attracting other iron-containing objects or aligning itself in an external magnetic field. Also in this same rule our minds could be defined as a MAGNET, which means A Person That Has A Powerful Attraction. If you keep a POSITIVE MIND you will attract blessing, success, beauty, good life, power, good health, and so much more. NEGATIVITY only breeds destruction, sadness, inferiority, problems,insecurity, etc. Rid your mind from Negative thoughts and saturate it with positive thinking. Positive mind nourishes the soul, gives you a picture of the Brighter side of life, you are at peace with yourself and those around you. It attracts LOVE towards you, YES, those around you will show LOVE and CARE to you. Positive mind attracts the right people to you, those that influence your life in a good manner be it knowledge, material things, financial help, job offers and lots more. They would be happy to establish business with you, trusting that you won’t disappoint them. Positive thoughts directs you on doing good to others by offering health care, academic care, financial care, selflessness, loyalty, You show love and care towards people without looking for or expecting rewards. I can go on and on to expanciate more on having a good positive mind but I believe that once your thoughts and mind are positive you will surely attracts beautiful and wonderful things into your life. So I urge us today to learn how to keep good thoughts and stay positive always.